A ground beef casserole can be many things and today I’m doing a kind of Tex-Mex style. The key to this is using a lot of Rotel tomatoes and green chilies for heat and blending ingredients to make a low calorie main dish that tastes amazing. Rotel is the tasty, spicy tomatoes and chiles I used for this recipe and two cans total around 125 calories. A one pound package of 93% lean ground beef was used which when browned, is low in fat and a total of 650 calories. Chopped onion and red bell peppers were combined with some black beans and frozen sweet corn totaling 540 calories. 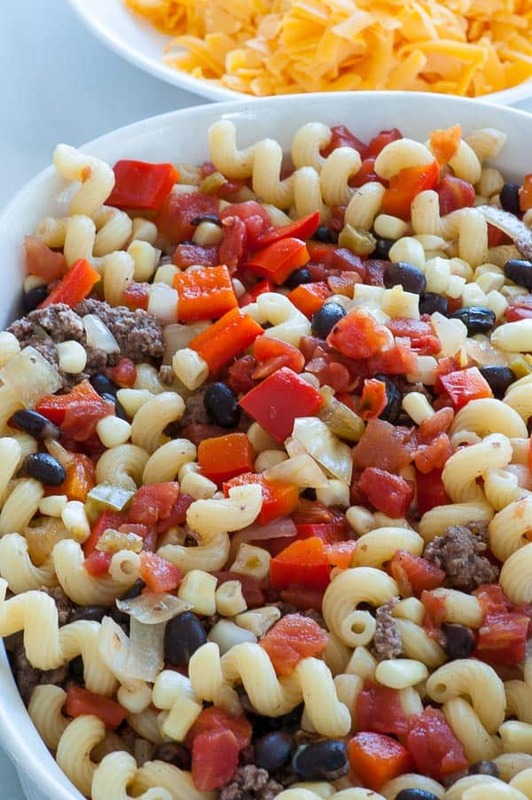 The curlicue pasta is Barilla’s cellentani which grabs the casseroles flavors in it’s many ridges. 8 ounces adds 800 calories. Finally, in keeping with the lower calorie count was 6 ounces of shredded sharp cheddar cheese. While this adds around 680 calories, it would be easy to use a lot more cheese if you wished. 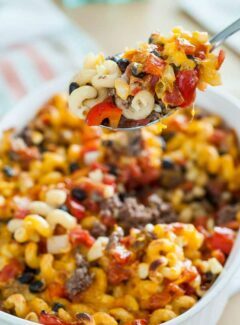 This Tex-Mex ground beef casserole feeds 6 people, is easy to make and is satisfyingly good and comes in at around 485 calories per serving. Not too bad for something this tasty. Place chopped onion, red bell peppers and vegetable oil in a large skillet on medium to medium high heat and cook for 5 minutes, then save in a large mixing bowl. Use the same skillet to fully brown the ground beef, 6 to 8 minutes. Add the corn, black beans and Rotel to the meat to heat, 2 minutes, then place in the bowl with the vegetables. Cook the pasta in boiling, salted water about 10 minutes just before it becomes al dente (Barilla recommends 11 minutes for al dente), drain and place in the mixing bowl. Mix the casserole ingredients together, taste and add salt and pepper, then place in a 3 quart oven safe casserole dish that has been sprayed with cooking oil. Top with grated cheddar cheese then bake for 35 minutes and the cheese has melted and the casserole has reached a temperature of 140°. Made it, loved it. Added a can of chopped green chilis and a dash of cayenne pepper. Just enough heat along with the Rotel to make you smile. 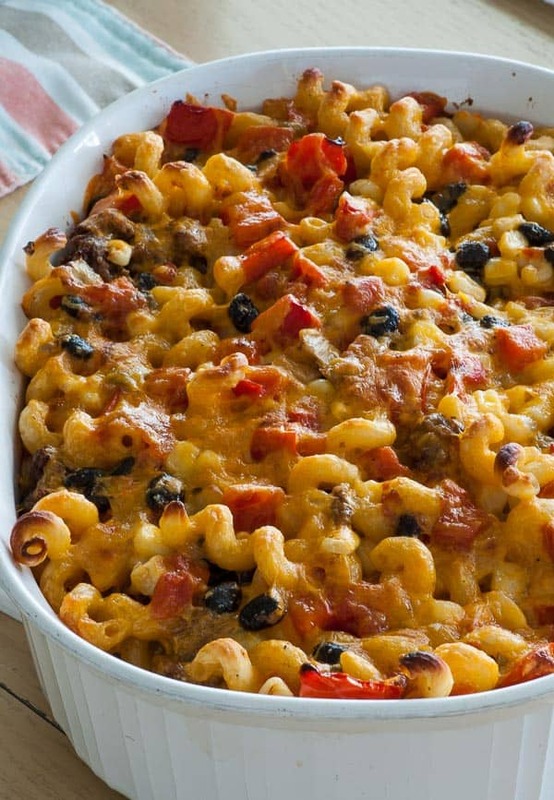 Excellent casserole recipe! 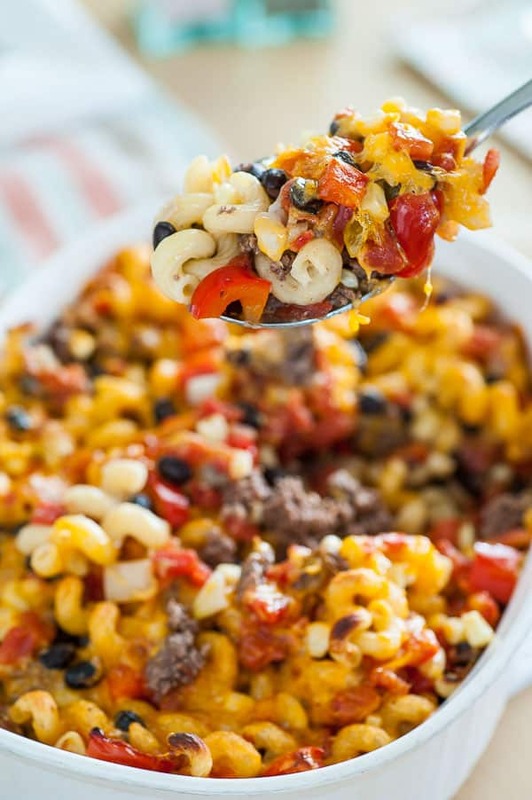 We all grew up on many different recipes for casseroles, (hot dish for the Sven and Ole crowd), but they all seem to lack the hot pepper bite that many of us crave now that we have become seniors. This one overcomes that problem! Thanks for the comment Alan. The Rotel original really gives this a nice kick.